Anxiety is reliably associated with an attentional bias favoring threatening information which is thought to be a key mechanism in the etiology and maintenance of anxious pathology. However, whether and how anxiety is related to attentional capture at a more basic level (i.e., in the absence of threat) is less well understood. To address this gap in the literature, we examined the association between anxiety and attentional capture in the context of visually salient, yet affectively neutral, stimuli. Specifically, we used a visual search task in which participants were required to locate a target while ignoring a salient distractor stimulus. A total of 122 undergraduates—half of whom were assigned to a state-anxiety induction—completed this task while event-related potentials were recorded and also completed self-report measures of trait and state anxiety. The results revealed that trait anxiety, but not state anxiety, was associated with impaired attentional control in the presence of a salient distractor. That is, behavioral slowing and the N2pc event-related potential—a neural measure of attentional selection—were enhanced for trait-anxious participants when the distractor was proximate to the target and required controlled attention in order to inhibit it. 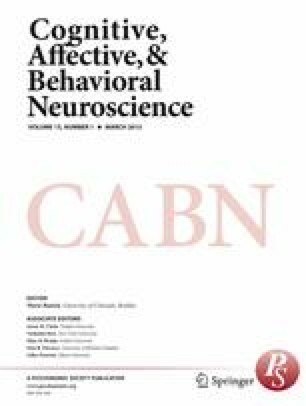 These findings extend previous work by providing evidence from multiple levels of analysis that attentional aberrations in anxiety reflect broad deficits in inhibiting distracting stimuli and are not limited to threat-relevant contexts.